Stepping onto Grand Classica is a little like taking a voyage back in time to an era when cruise ships were less about whizbang attractions like surfing, Broadway shows and laser tag. Here, cruising is more about lying in the sun, playing silly pool games and getting away from the daily grind -- even if only for a short while. Sailings on Grand Classica are convivial; everyone's onboard to have a good time, and crew work hard to give the best service they can. Throughout our sailing, the crew never once lost their smiles, upbeat attitudes and can-do spirits. Design-wise, Grand Classica -- previously Italian cruise line Costa's neoClassica -- is a stately ship with an Italian air, lots of real Murano glass decorations and roomy lounges perfect for live music and dancing. To lend a Bahamian vibe to the ship, the line has renamed all the decks after islands in the Bahamas (Exuma, Bimini, Paradise, etc.) but the ship's color palette and decor don't match the new names. It's important to remember, too, that Grand Classica's age (the ship launched in 1991) and storied past sailing under the Costa name means it looks worn in some areas. You'll notice some rust near the spa and on the pool deck, for example; the pool deck bathrooms also look like they haven't been touched since the ship entered service. In a similar vein, the experience -- from dining to activities -- also is pretty average, but it gets the job done. Grand Classica is designed for quick, budget-friendly getaways, so you shouldn't expect Broadway-caliber entertainment or celebrity chef-style dining menus. All of these are easy to shrug off in the mere two days you're onboard the ship, though, especially when you’re more focused on lounging by the pool with an umbrella drink in hand, enjoying a beach day in the Bahamas or reveling in all the nighttime entertainment options. The bottom line is this: Grand Classica is comfortable and fun, and there's plenty of food and activities (some at an extra cost) to keep you satisfied -- so you can pack in as much or as little R-and-R as you want for a small investment of time and money. Grand Classica draws primarily from South Florida, with almost all passengers driving to port. But because South Florida has such a diverse group of residents, the passengers onboard each cruise are often an international mix. You'll especially find lots of Spanish speakers and, during school holidays, lots of families with children. During the college spring break period, you'll also find plenty of young 20-somethings. 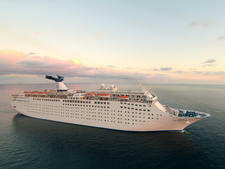 The ship draws avid gamblers, too, as Bahamas Paradise Cruise Line has a robust casino program that spans both ships. Most people on the ship are there for the two-night cruise, but some passengers do opt to disembark in Freeport and stay at a resort for one or more days before hitching a ride back on either Grand Classica or Grand Celebration (via the line's cruise-and-stay packages). Cruise Critic’s professional photographers and our extraordinary community members have taken 548 pictures of Grand Classica . When you visit our photo galleries, you can be assured that what you see is what you get. It doesn't get much more casual than a Grand Classica cruise. Though technically you're required to wear shirts and shoes everywhere but poolside, don't be surprised to see people in their swimsuits practically everywhere. Yellow Elder (the main dining room), Admiral's Steak & Seafood and Rock Grill (both specialty restaurants) do require a bit more dressing up: at minimum, long pants or dressy jeans are required for men and women, with collared shirts a must for men. Most women don dress pants paired with a blouse or a sundress. Fares on Grand Classica are exclusive of service fees; a $12.95 per person, per day charge is added to your overall bill for all food and stateroom services. Additionally, an 18 percent service charge is automatically added on all bar, drink package, specialty dining, and spa or salon purchases. The onboard currency is the U.S. dollar. Throwback to old-school cruising with set-seating dining and midnight buffets; operates two-night cruises to Bahamas and back; holds about 2,000.